← Recipe Adaptors now has a Facebook page! There is nothing like fresh bread. One of the things that stops me from making bread more regularly is the amount of time that the dough needs to prove. However, this method lets the dough sit overnight in the fridge, so it is much more convenient! 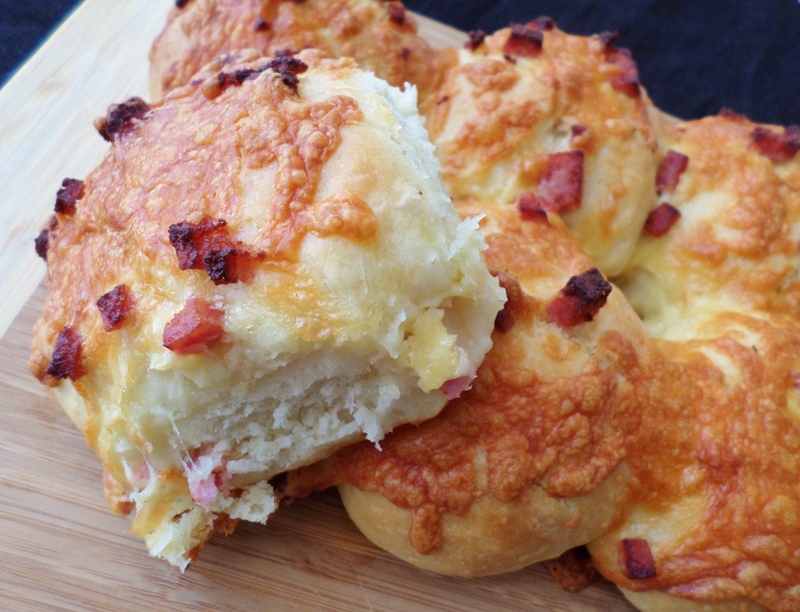 If you don’t want to top your rolls with bacon and cheese, then leave them off for plain rolls, or substitute something else. As with all home-made bread, these are best eaten on the same day that they are baked. Put the yeast, 1/2 cup water and sugar into a small bowl. Mix and then set aside in a warm place for 10-15 minutes or until frothy. Put the flours and salt into the bowl of your electric mixer. Use the dough hook on a low speed to give the flour a couple of mixes, just to incorporate the salt. Once the yeast mixture is frothy, add it to the flour in the bowl along with the additional water. Use the dough hook on a slow speed to mix and bring the dough together. If there is still a little bit of dry flour then gradually add drops of water until the dough comes together. Knead the dough (using the dough hook still on low speed) for a minute. Remove the bowl from the mixer and cover the top of the bowl with cling wrap. Set aside in a warm place for an hour, then put in the fridge for 8 hours or overnight. Remove the bowl from the fridge and leave to sit for an hour to take off the chill. Using lightly floured hands, give the dough a very quick knead until it is smooth again. Spray a large baking tray with a little cooking spray. Divide the dough into 8 equal pieces and use your hands to form the pieces into balls. They don’t have to be perfect. Place the dough balls onto the prepared tray, leaving some room for them to expand. Cover the whole tray loosely in cling wrap and set aside to rise in a warm place for 30 minutes. Meanwhile, heat your oven to 200C/180C fan forced/390F. Once the rolls have risen, spray them with a little oil or cooking spray and then scatter over the bacon and cheese. Bake in the oven for about 25 minutes or until just golden. When you pick up a cooked roll it should sound hollow when tapped on the bottom. 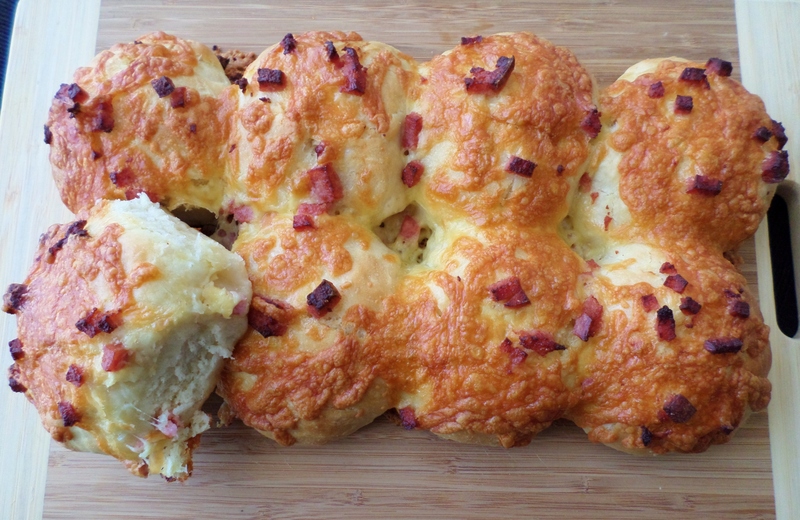 This entry was posted in Baking and tagged Bacon, Baking, Bread, Cheese, Food, Lunch, Recipe, Recipes. Bookmark the permalink. These rolls look so very tasty. Love such dough, that can be made overnight.